This article was written By John Berra on 17 Nov 2015, and is filed under Interviews. The diverse cross-section of filmmakers that constitutes China’s documentary sector encompasses a range of backgrounds and motivations – some have received training through academic or industry channels while others are self-taught as a result of affordable digital video technology. Liu Xiaoran chose to develop her voice as a documentarian through post-graduate study and has since balanced personal independent projects with more commercial assignments for Phoenix TV and China Central Television (CCTV). 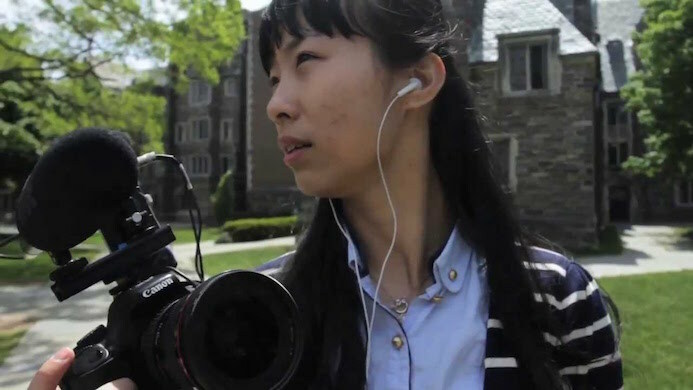 A graduate of Columbia University, Liu utilized her overseas study experience as the material for her insightful documentary Crossroads of Journalism Dreams (2015), which follows her Chinese classmates over the course of a particularly challenging year as they juggle coursework, culture assimilation, and the challenge of securing a professional position within American media despite having limited experience of the West. Succinct but thorough, its 68-minutes are, by turns, enthusiastic, poignant, tense, yet ultimately sanguine about the future of Chinese journalism. 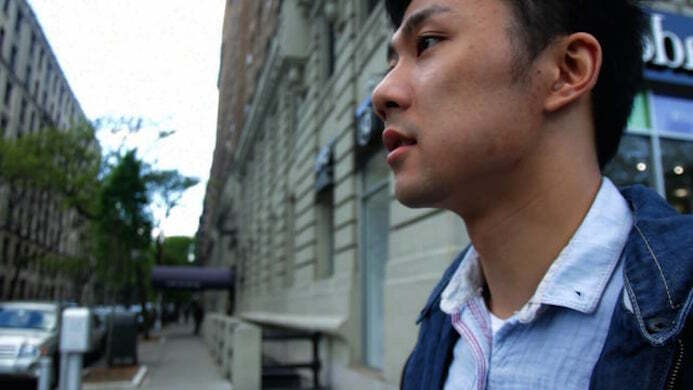 While studying at Columbia, Liu also co-directed The Noodle Guy (2013), a humorous piece that initially seems far removed from the frustrations of Crossroads of Journalism Dreams. However, this account of the efforts of former actor Peter Song to establish himself in the United States through noodle making is also concerned with the hopes of a Chinese immigrant in a land of opportunity. Liu followed Peter back to China when he visited Lanzhou in Gansu Province where he aimed to improve his culinary skills by studying with a local chef while also shooting scenes for his short comedy Kung Fu Noodles. Not discussed in this interview but also very much worth seeing is Liu’s documentary Lost Waterside (2014) which surveys an agricultural village suffering from drought that must adjust to a new way of life. Although still at an early stage in her career, Liu’s work already demonstrates a deft balance between personal stories and a sense of the bigger picture that informs individual struggles. Crossroads of Journalism Dreams has been screened in China and the United States with Liu on hand for Q&A sessions that have found her answering inevitable questions about the widespread censorship of mainstream media in her home country. 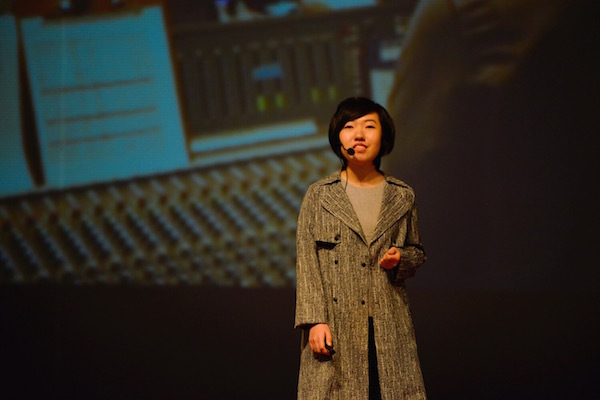 This flurry of activity led to a TedX talk in Chongqing (pictured above) that found the documentarian expressing her views on journalism to several thousand attendees. John Berra met with Liu Xiaoran in Beijing to discuss her work to date. 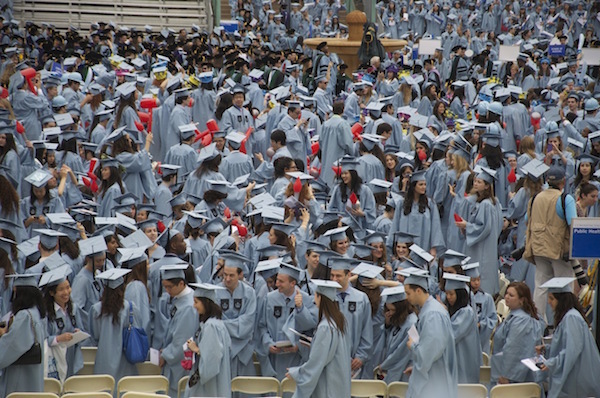 What was your academic background before you went to Columbia? My Bachelors degree is from Renmin University of China, and there I had double majors – one is journalism and the other is new media design. Journalism was at the journalism school and New Media Design is at the Arts School. After that I studied for my Master’s Degree at Tsinghua University in journalism with the School of Journalism and Communications. Then I went to do another Masters at Columbia University where my concentration was in Broadcasting. How did you develop an interest in documentary? When I was studying in Renmin University, I also had a part-time job at Phoenix TV, working as a director, but on a very short, daily broadcasting programme of only four to five minutes. After that, I thought I needed to do something longer, because I had an interest in telling deeper and longer stories, and I was not so satisfied with those five-minute stories, so I tried a twenty-minute story to see if I could handle it. After doing that documentary, I decided that this is what I wanted. Why did you choose to make a documentary about journalism dreams while studying at Columbia University? It started as a video diary in the first semester, in September to October of 2012. I wanted to make that time into a story so that after ten years, twenty years, or thirty years, I could watch it as a one-hour documentary and remember everything without going through all my footage. So after two or three months in Columbia, I talked to my friends, my classmates, and I told them that I wanted to do a documentary about our lives that would mainly be about our thoughts and our choices. At the same time, I could chronicle their life experience and study experience at Columbia. Some people said, “Yes I want to do it, you can follow me,” but one girl said, “I have to think about it because it’s really a big deal, you will need to follow me for a year or more than that, and you will need to get into my thoughts, and I have to share everything with you.” So I gave her a few days to think about it, and after that she said, “I think it’s good for someone to follow me for a long time to chronicle everything because it’s not easy to get into Columbia and I want to remember every minute.” So from there I followed other students, not just my own life, and I followed them for a year. How hard was it to remain objective and see your friends as subjects? The biggest challenge was in the relationships between myself and my classmates, because I am the filmmaker and they are the interviewees, so that’s one relationship, and when we jump out of it, that’s another relationship. When I have the camera on, they feel like there is a distance, so when I ask questions about their life, relationships, and feelings, they feel like I am not their classmate. But when I put the camera down, the vibe completely changes, and they say, “Finally, you’ve put your camera down and now I can talk to you.” This happened a lot in the beginning and confused me. It gave me a lot of challenges because I did not know how to break the wall created by the camera. And I tried very hard because we were already very close, and I don’t know how to be closer to them. And they felt that the camera made me another person. Then I found a trick, which was that I would have my camera all the time. They would not know if the camera was on or off and they would just talk because they were very close to me, and you can see that in the documentary. Were there ever any occasions when you were aware that a situation was great for the documentary but inappropriate to record as a friend? Yes. If there were ever a personal thing, a relationship, that they did not want to expose on camera, we would talk about it. My friend would say, “All the footage that is related to the relationship, you must cut it out because I don’t want it exposed to the audience.” And I would say, “You can trust me, I won’t put that kind of thing into the documentary.” And, to be honest, if I had included these things, it would be so interesting. You would feel that these students are not just worried about their careers or their studies, that they are also worried about their relationships, and that their decisions about staying or going home are also related to their lovers. But I had to cut those things out. It was correct because I needed to protect them – the reason I could do this documentary was because of the trust between myself and my classmates. How did your approach to documentary change after studying in the United States? After I came back to Beijing following Columbia, I showed my documentary Crossroads of Journalism Dreams to a lot of friends, and they said, “This is so American, this is such an American approach to doing documentary.” And I was confused. I don’t know what is ‘Chinese-style’ or what is ‘American-style’. But my professional friends said, “I feel this is American, and I can tell you have been to Columbia.” They felt that the way that I do the interviews, and the way that I put the viewpoints together was very American. For this documentary, I interviewed probably twenty people and more than ten of them are in the documentary with four to five main characters, so I tend to make it deeper and not a one-person story to reach more people and keep a balance. Because I include a person who went back to China, a person who decided to stay in America, a person who thinks Chinese journalism has a bright future, and a person who does not think so. And also I put my own viewpoint in there because it is my documentary and I do not want to make a documentary that does not have a soul, the kind of documentary you see on television that gives you lots of different voices but you do not feel anything. At the end, I want to tell the audience what I think. So, I think that is what I learned in America. I learnt to listen to different voices and allow them to speak out. One of your subjects raises the important point that there is no true objectivity. He acknowledges that the Chinese way of doing journalism is not perfect, but that the American way is a flipside, with the ideal actually being somewhere in the middle. The value of Chinese and American journalism is the same – we all look for objectivity. Some people say that Chinese and American journalism are so different that they have different values. I don’t agree. I think we all know what is ‘good journalism’. We want to tell the truth. We want to reflect the real world. But there is no real objectivity there. Objectivity only exists in a perfect world. In China and America, there are so many different aspects that affect journalism and news, but they are different. For example, in China we may have government censorship that affects objectivity, but in America they have other things, like large corporations and companies that affect the news. I agree that there is no real objectivity, but in America we learned to balance different opinions and viewpoints, to give people the chance to say what they think out loud. In China, sometimes we just do a one-person story, but in Columbia we are told not to do a one-person story, which is a story that is just a profile of one person. We are told that we should do a topic or follow an event, as interviewing one person is not acceptable. For a student, if we do a one-person story in China, it’s acceptable because the teacher may think we do not have a lot of resources, but in America, the standard is stricter. Although it is primarily concerned with the daily experiences of international students, your documentary raises the issue of media censorship in China by the state through its broader subject matter. How do you feel about this issue? My friends and I think that censorship is everywhere, both in China and America. In China, the government controls censorship, but in America you can find censorship from the market, and some media is controlled by one party. A lot of people ask me about censorship at screenings, and I don’t have a very extreme view about it. Sometimes, I tell a lot of inside stories and I feel like it is a discussion; sometimes, I am afraid there will be a report about me where I am quoted, but after many screenings, nothing has happened. That is the reason why I insist on being at every screening – I need to be there so I am asked questions and can explain things and explain myself. I have my viewpoints in the documentary and after every screening I feel that everyone understands me perfectly, because I think they are touched by my passion, my journalism dream. I’ve noticed in China that expectations of documentary are often more concerned with style or production value than content. Western documentary is about capturing things as they are happening so viewers accept that footage will often be rough. However, audience members at post-screening Q&A sessions here will sometimes suggest that the filmmaker should use a tripod in future to make the footage less shaky. I know a lot of Chinese independent documentary filmmakers whose work is very rough and captures reality, but a lot of the documentaries made by the television stations actually write a script so they know what kind of shots to get. You can call it a ‘Chinese style’ but it’s more of a ‘television station style’. For most people, documentary is what they see on TV, which is the CCTV documentary channel, programmes like A Bite of China or programmes about China doing business with the world. That’s their main way of watching documentary. They also watch documentaries online, but most independent filmmakers just do screenings and do not put work online. Most people can’t go to the screenings so a lot of people think that A Bite of China is the only style of documentary. But I think the audience is changing its view now because some documentaries are going to cinemas, like Ladder to Paradise [a record of Tibetan mountain guides], which was produced by my mentor in Tsinghua University [Lei Jianjun]. And that one has no interviews and is more like a film, so audiences now know that there is a more fascinating style of documentary that can tell a story and be very exciting. The title of Crossroads of Journalism Dreams evokes “The Chinese Dream”, which is vaguely defined idea. You walk into the subway in Beijing and there is a big poster with that slogan and an image of a high-speed train. I feel that, in China, the use of the world ‘dream’ refers to something that is achievable whereas in the West it’s suggestive of fantasy. I think you are right but it depends on the person. Some people think dreams are approachable, others thing they are fantasy. To me, the title of Crossroads of Journalism Dreams means a faraway thing that we cannot approach right now. There’s one line in my documentary, which is, “Now I think we have to wait. We have to wait and compromise because later in the future it will be easier for us to stay in America and in China there will be more freedom for us to do journalism.” This is a way of saying that there are two perfect worlds, but we cannot reach them right now, so we are at a crossroads of two worlds. You can turn wherever you want to go. You can turn freely and pursue your future. You have a choice without limitation. Right now, that’s not true. Both a free but not so free, both have limitations. Your documentary is as much about job hunting as it is about education. By the time it’s halfway through, everybody is already worrying about finding employment. Bureaucracy drives the drama more than completing courses. So how much time of that MS year is really devoted to learning? After half a year, we began to think about how to stay in America because after graduation our student visas will expire and we need OPT [Optional Practical Training] to extend our visa. But if you want to get OPT, there is one thing you need to do, which is to find a company that wants to hire you or will offer you an internship. So sometimes we feel so depressed because we were just in New York for two or three months, then after the Christmas holiday, everything changes because you have to find a job. That’s almost impossible because when I got to do interview with American companies, they ask how long I have been there. So the second semester started in January and we already started trying to find jobs. OPT is very tricky because you need to apply several months before graduation and meet several deadlines to get your OPT in time. I applied for OPT and it went very smoothly, but for two or three friends of mine failed in the process. They mailed all the materials but they bounced back because the photographs were not OK, so they had a gap for a few months and had to go sightseeing. We had lectures about OPT at Columbia to tell us how to apply. The second half is very tense, even draining – your classmates have been shown this world, but the door is gradually closing and they might have to leave. How did you manage to record this experience while going through it yourself? Actually, I gave up a lot of things in order to film this documentary. At the careers expo that you see, I was carrying a large black camera bag, and I didn’t ask for filming permission because I was overwhelmed with the preparations for job hunting. Also, I was a little bit afraid that they would not give me permission because I was not from the media. But on that day, I had my camera in my bag, so I thought if I could film for five minutes, it would be enough footage. So on that day I started to film my classmates and nobody asked me about what I was doing, so I filmed them all day. But that was a big sacrifice for me, because most students can have six to nine interviews on that day, but I only had about three because I was filming. And my choice to come back to China after graduation was maybe based on this. I did not have time to do job hunting because I decided my documentary was more important. After the careers expo, I filmed the students who were doing video interviews, and that time I had something scheduled related to my job hunting but because there was again a conflict, I chose the film. For the first semester, it is like this whole world is opening up and everything is so new, but at the same time, we had to solve the language problem, the cultural differences, and in the second semester, we have to focus on job hunting and our Master’s project, which was The Noodle Guy. Could you not use Crossroads of Journalism Dreams as your Master’s project, or did it not fit with project requirements? At that time, the schedule was tricky. We needed to finish the main filming of the Master’s project before May, but Crossroads of Journalism Dreams would not be finished by late May as I would still not have the most important scenes. I filmed on graduation day, but the storyline was not very clear so I could not use it as my Master’s project. We did research for The Noodle Guy during the Christmas vacation and pitched it in January. At that time, I did not have a storyline for Crossroads of Journalism Dreams, I didn’t know if it was a story or not – I did not have the careers expo or the decisions of the students. I talked to my supervisor at Columbia and told her I was filming two documentaries – The Noodle Guy and Crossroads of Journalism Dreams. I thought my supervisor would say, “You are a hard-working girl, you have my blessing,” but it was just the opposite! She was actually a little angry. She said, “I’m afraid you cannot do the two documentaries at the same time because The Noodle Guy needs a lot of filming with going to Flushing two or three times per week.” So I agreed not to put extra effort on Crossroads of Journalism Dreams, just to film my friends throughout the week. So how did you find Peter Song? We did a lot of research. I have a partner, my co-director, Wu Yihuan, who is also in Crossroads of Journalism Dreams, and who is now working in the film industry in China. We had a lot of conversations about what kind of stories we wanted to do, and decided on new Chinese immigrants to America. There are two Chinatowns in New York – there is the old one in Manhattan, and the new one in Flushing, Queens. And actually we went to the old one first to find those very obscure people, who are mostly ignored and neglected, but we thought that was a bit cliché because there are already a lot of films about the old Chinatown. So we went to the new one and found a very interesting basement. The street is kind of like China and the door to the basement is almost hidden. Then you need to go down the stairs and you find a new world where there are so many food stalls, probably ten to twelve shops. But we didn’t know which one to film. At first, we wanted to film the space. It’s called ‘Golden Mall’ – it’s a basement, but they call it a mall. We thought it was so interesting. Everybody there is a Chinese immigrant and probably half of them don’t have legal status to stay in America. So we interviewed everyone and asked them to tell us their stories, how they got to America, how long have they been there, what were their obstacles, and whether they would ever go back to China. And then we found Peter Song. Peter was working in one of the ramen noodle shops, but he is not the owner. We asked to film the owner, and he said “no”, but recommended that we film Peter. And we found Peter to be the most interesting person that we found in that space. Yihuan and I talked about whether we wanted to do a story about this space or a story about Peter. We couldn’t decide, so we followed Peter for several days to see if the story was strong enough, and it was, so we stopped filming the other business owners. When you went to Columbia, did you expect to work on Chinese subjects or did it surprise you that you ended up addressing your own culture in another country? Actually, all my classmates chose a subject that is related to our culture because in Columbia, we felt that, if we wanted to do a deep story, we need to know the culture very well. All the Chinese students of my year decided to do stories about our culture, not because it’s easier, but because we can do it deeper, and we can find an angle that American students cannot. We have the access and the resources. At one point, Peter says, “Flushing looks like China from a decade ago.” Was that your impression of that part of Queens? Yes, because in Flushing, you don’t need to speak English. It’s just like China. At the place where they sell newspapers, there’s a TV, and it shows CCTV. And a lot of people just stand there watching CCTV. But the owners don’t want to go back to China. Flushing is perfect for them because a lot of them don’t speak English. They could not survive in Manhattan. Peter is an interesting subject because having been an actor in China where he appeared in the film Say No to Tall Rich and Handsome Guys, he is always performing and your documentary has a ‘star’. The reason why we chose Peter was that he is very familiar with the camera. He is very outspoken and he is our age so we can communicate very easily. We became friends. Sometimes, we could tell that he was acting for the camera, which is not good because we want to film the real him, but we felt we could fix that problem as he will open up because he cannot put up a wall all the time. But I’m still filming Peter now, and the documentary is not really finished. I’ve filmed Peter three times since we made the documentary, twice in Beijing and once in New York. 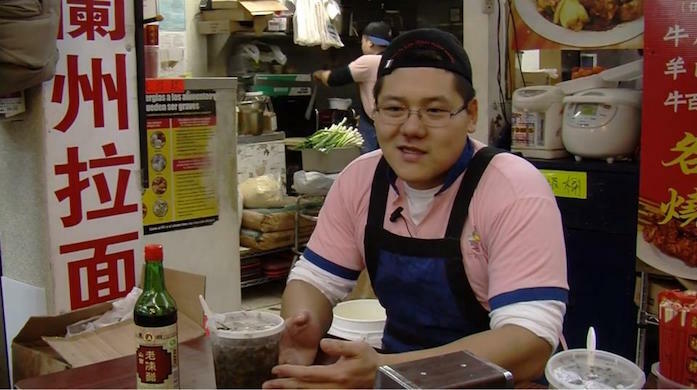 He has two brand new ramen noodle restaurants in Manhattan. The documentary is really just the beginning because he has a restaurant near Times Square now and he’s the boss. He’s really somebody now, but when we met him, he was nobody. We’re really close friends now. Sometimes he’s still acting for camera, but I can tell when he’s doing that. And I can choose which footage to use. 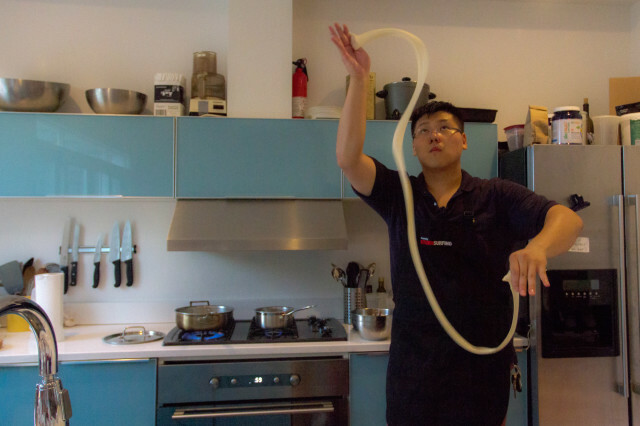 Tell me about filming in Langzhou, Gansu Province, where Peter trains with a noodle master. Peter describes it as “the second most dangerous city in China”. We filmed near the railway station. We had our equipment with us and we were very nervous. People can tell we are not local. Nothing happened, but we were very nervous. Most of the filming was actually in a small town that is three or four hours ride from Langzhou. We filmed so much interesting stuff, but only about 10% is really shown in the documentary. And it is interesting because you cannot imagine how hard it was for Peter to deal with the local people – they see him as a foreigner, as an American, and they wanted to ask for money for him. But we felt that was not the main storyline, because it talks about another topic. I watched your two documentaries back-to-back; one is a very melancholy look at student frustrations and the other is a more upbeat piece about someone turning their life around. The students are plagued with self-doubt despite their competence, whereas Peter is driven by super-ego. What was it like jumping between those projects? Crossroads of Journalism Dreams is actually my life; Peter’s story is more fun. Peter’s story was for my studies and my story was for myself. Now you see the documentaries are completely different but I can find some similarity between the two because I’m using the same filming style, following the person and going deep into his or her background and story. At the end, this style appears in two completely different documentaries.